To prevent infections, reduce swelling, and compress the skin into its proper place, your doctor will apply dressings to the affected areas. These may be made of support hose, elastic bandages, or other garments, and must hold the skin in place tightly. If the affected area is leaky, your doctor may also insert a drainage tube to prevent fluid from building up during the first few days. 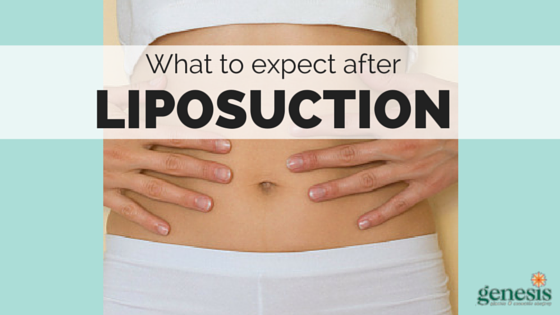 Most liposuction patients have to keep their bandages on for several weeks. Your doctor will provide you with instructions for obtaining and replacing the bandages during this period. Although the risk of infection after surgery is low, antibiotics may be provided to you to keep the affected area clean, especially if you have a prior history of infection. Follow your physician's instructions for cleaning and caring for the affected area, and watch out for signs of infection. Expect high levels of swelling, bruising, and pain for the first ten days or so after surgery, but should gradually go down after this point; if they persist for several weeks, contact your doctor. Also watch out for breathing difficulties, as these are a sign of embolism, a potentially fatal side effect. Your doctor will also provide you with medications to reduce the pain of surgery. Liposuction usually leaves small scars in the area where fat tissue was removed, which fade over time. The procedure may change the color of your skin around the affected areas, usually by making it more grayish. Liposuction will not affect stretch marks or cellulite, and may not change your appearance as much as you expected. Your remaining body fat will take some time to settle into place, during which time the affected areas may appear uneven or lumpy. Your skin will also be loose, baggy, and vulnerable to tearing. Your skin and fat will usually even out within 6 months, though some areas may remain lumpy or loose, particularly in older patients. The effects of liposuction on mobility vary depending on the location of the surgery and the amount of fat removed. Many patients can walk out of the hospital a few hours after surgery, but some may have to stay overnight. Your doctor will likely recommend that you avoid physical activity and stay home from work for at least a few days after the surgery. To avoid tearing, injury and infection, wait for several weeks after the surgery before you begin to exercise. However regular exercise and dieting are essential to prevent fat from returning to the affected areas, so as soon as your doctor declares you ready to exercise, you should do so. All operative sites will be numb for two weeks to two months. The decreased sensation rarely lasts longer. However, there may be abnormal sensations to a much lesser degree for a year or so. All areas will bruise and swell for about two weeks. This may be decreased by good self-care and following instructions given by your doctor. Rarely does significant bruising last longer than two weeks. All operative areas will go through a firm, hard stage which may last a month or more. During this period, tingling and shooting sensations may be felt as well as tightness, itching and drawing sensations. Realize you may experience all or none of these normal post-operative findings or you may experience different things. It is extremely common to have one side more bruised and swollen than the other. The main thing to remember is that it’s important to report findings to your doctor and to call about any questions – no matter how small. See Before and After Liposuction photographs here.